WTOP Film Critic Jason Fraley looks at the franchise's symbolic cross-cultural legacy, while offering a video review of the new "Godzilla." WASHINGTON — Cinematic social commentary comes in all sizes. Sometimes, it arrives as a New Wave art masterpiece such as Alain Resnais’ “Hiroshima Mon Amour” (1959). Other times, it comes as a monster movie blockbuster, such as Ishiro Honda’s “Gojira,” a.k.a. “Godzilla” (1954). No doubt, the big green lizard remains cinema’s most iconic importer-exporter between U.S. and Japanese culture, fittingly driven by a director named Honda. While moviegoers in both countries turned out to see the spectacle of a man in a giant rubber suit stomping on miniature Tokyo sets, subconsciously the film worked as a metaphor for the U.S. dropping nuclear bombs on Nagasaki and Hiroshima in 1945 to end World War II. It also spoke to the paranoia of the Cold War 1950s, with the ever-present threat of nuclear annihilation. While “Kong” ranks No. 41 on the American Film Institute’s Top 100 Movies, “Gojira” ranks No. 31 on Empire Magazine’s Top 100 Films of World Cinema. While “Gojira” was released after Ozu’s “Tokyo Story” (1953) and Kurosawa’s “Seven Samurai” (1954) in Japan, it beat both to American theaters. The 1956 U.S. release was renamed “Godzilla: King of the Monsters,” dubbed into English and re-edited to include newly shot scenes with American star Raymond Burr (TV’s “Perry Mason”), who had played Mr. Thorwald in Hitchcock’s “Rear Window” the same year, 1954, that “Gojira” hit Japan. 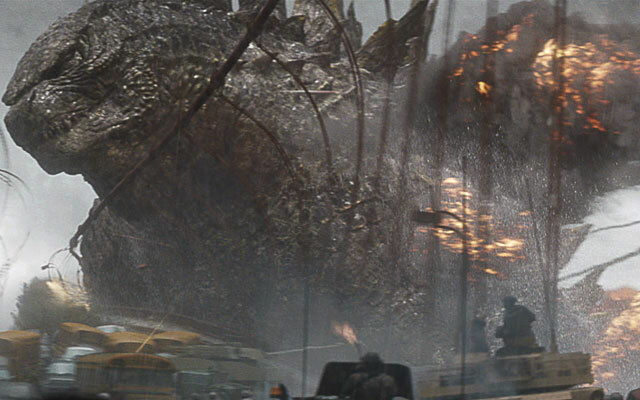 Since then, Godzilla has seen at least 27 spinoffs, facing everyone from King Kong to Mothra, Hedora to Destroyah. It’s one of those movies you swear you’ve seen even if you’ve never seen it, thanks to countless pop-culture references, in everything from comic books to video games to music. Flash forward now to 2014, with a horrible 1998 flop thankfully in the rear view mirror, albeit with a Puff Daddy-Jimmy Page riff still on our iPods. Are objects in mirror still closer than they appear? Or does the latest Hollywood remake keep the legacy alive? See where this film ranks in Jason’s 2014 Movie Guide. Follow WTOP Film Critic Jason Fraley on Twitter @JFrayWTOP, read his blog The Film Spectrum, listen Friday mornings on 103.5 FM and see a full list of his stories on our “Fraley on Film” page.